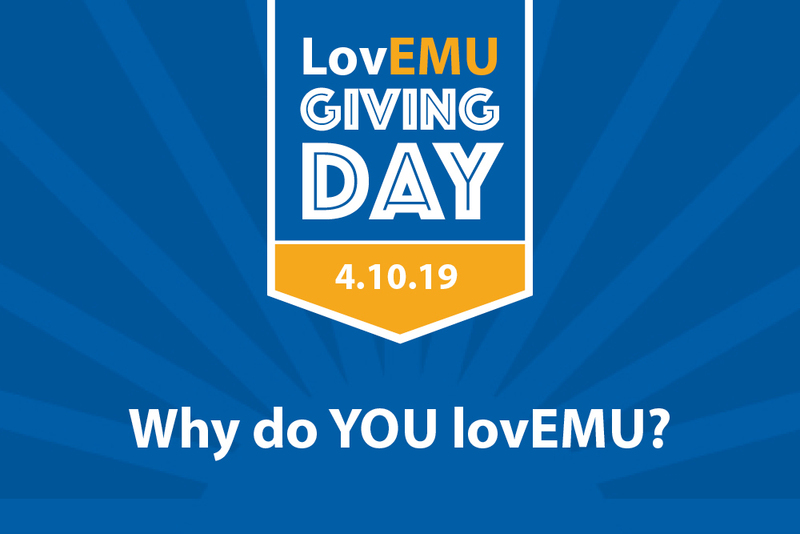 Join us April 10 for the third annual LovEMU Giving Day, 24 hours of celebrating the impact of EMU on people and communities around the world. An EMU education transforms lives. We hear this all the time from alumni around the world. They talk about favorite professors, cross-cultural study, their teammates, friendships that start at EMU and are still growing strong years afterwards. An EMU education has a far-reaching impact. We hear this from parents, friends and co-workers of alumni. Help make the EMU mission accessible to all, as we continue a 101-year-old commitment to prepare undergraduate, graduate and seminary students to serve and lead in a global context. Show your love for the impact EMU has had on you and others, so that students who may not be able to afford the quality academics and opportunities can benefit, too. For each online gift, donors can vote for a club/organization, academic program and athletic team to highlight what they love(d) about EMU. The program in each category that earns the most votes will win $500 for their program/department use. Give to the 50-State Challenge to turn the nation Royal Blue! When we receive gifts from all 50 states, we’ll unlock $5,000! The Sweetheart Challenge continues. Two alumni sweethearts will give $6,000 if 50 alumni couples who met at EMU give a gift. If you graduated in the last 10 years, join the Young Alumni Challenge: your gift of $10 or more will be matched by a generous board member. If 300 gifts are given in the Alumni Challenge, an alum will add $15,000. Parents and grandparents, $10,000 will be unlocked if 50 participate. Additional challenges include current students, faculty/staff, and a special lunch-hour buzzer-buster. Students can jump in with a spontaneous gift of any size. They might also text grandparents, uncles, aunts and others who are supportive of the EMU experience their loved one is having at EMU. Alumni are gathering in locations across the country, including locations in Virginia, Washington D.C., Pennsylvania, Indiana and Ohio. Find your nearest location here. Post a pic of you and friends on Twitter or Instagram using #EMUGivingDay and tag EMU! Change your profile pic and share LovEMU images on Facebook, Twitter and Instagram before and during the day, using #EMU Giving Day. When you visit love.emu.edu, share your love and Royal pride in the comments section when you make your online contribution. Tell us what you loved, learned and remember from your EMU experience. The size of the gift does not matter. It’s participating that is important. “EMU’s financial aid is as generous as we can make it for both merit-based and need-based undergraduate student aid,” says Michele Hensley, financial aid director. The average financial assistance package for an undergraduate student in 2017-18 was $30,000. Over $14 million in aid was awarded by EMU last year. Plan to Show the Love! Plan to show your love on LovEMU Giving Day April 10 by giving a gift online, phoning in a pledge at (540) 432-4200 or (800) 368-3383, or emailing your intentions to devoffice@emu.edu.